The new Dodge Charger has become a very popular sedan. This is because the Charger has a good mix of performance and technology. The new Charger has many new tech features that help you personalize it. One feature that helps with making the Charger your own is the customizable menu in the infotainment display. This allows you to keep the apps that you use most often in a place where you can easily access them. Another tech option on the Charge is SiriusXM Travel Link. This service can display local gas prices and weather. It can also display local sports scores and movie showtimes, helping you keep connected with your community. The Dodge Charger has plenty of technology to help you enjoy your commutes as much as possible. 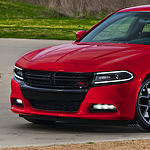 If you want to learn more about the features of the Dodge Charger visit us at St. Paul Chrysler Dodge Jeep Ram. We are in St. Paul and we look forward to answering any question you may have on the Charger.